The Citadel of Aleppo is one of the oldest monuments in the world. It is the most famous historic architectural site in Syria and is built on top of a huge, partially artificial mound rising 50m above the city and surrounded by a trench. This article describes its internal and external structure and full features including its history. Since its inception, the Citadel has been named after the city of Aleppo. Evidence from an archaeological excavation in Al-Qaramel Hill, a suburb of Aleppo, reveals the existence of circular residential houses that go back to the tenth millennium BCE and carvings in rocks (cave houses) and excavations around Aleppo confirm that it is the oldest city in the world that is still inhabited. Aleppo has been damaged as a result of wars, invasions, earthquakes and epidemic plagues, but the city has continued to rise from the ruins and survive. The city of Aleppo was mentioned in the tablets of Mari dating to 2850 BCE It was destroyed by Rimoch the Acadian in the middle of the third millennium BCE and by the Hittites in the early part of the second millennium BCE Aleppo has been conquered by Mitannians, Egyptians, Babylonians, Assyrians and Persians. Since 330 BCE Aleppo was a part of the Hellenic Circle and was known as ‘Bereoa'. Aristotle, the philosopher, who accompanied Alexander the Great's army, enjoyed Aleppo's good climate and clean atmosphere. He chose the city to live in while recuperating from his illness. When Seleucus Nicator rebuilt the city in 312 BCE, he renovated the Citadel and used it as a military garrison. He constructed a straight street, which still exists today, between Al-Zarb Market in the east to Antioch Gate in the west and branching into 39 covered Souks (markets). In 64 BCE Pompey initiated a relationship between Aleppo and Europe, and it continued to flourish during the Roman Era. Due to its strategic location, Aleppo became an important religious and economic centre. In the Byzantine Era, Aleppo was a great Christian centre. Helen, the mother of the Emperor Constantine, built the great cathedral which was converted into a school and mosque in 1124 C.E. during the Crusader siege in Aleppo. The cathedral is now the Al-Halaweih school. Notwithstanding, the political differences between Europe and the successive Islamic states, Aleppo remained the main centre for international trade. Despite the ferocity of the Crusader wars, Aleppo signed a commercial agreement in 1207 C.E. with the State of Venice under the rule of Al Zaher Ghazi Al-Ayyubid. This was the first economic agreement between Europe and the Eastern Arab World. The agreement was renewed during the Mamlouk Era to include the rest of the Italian cities, Portugal, Spain, etc. During the Ottoman era, which lasted for more than 400 years, Aleppo was the economic capital of the Empire which extended from the Danube in the west to Iraq in the east and over North Africa and the Arabian Peninsula. Some historians stated that goods which took three months to be sold in Cairo were sold in just one day in Aleppo. In 1535, the Ottoman Sultan signed an agreement with Francois the First, King of France, which increased and invigorated the French Community in Aleppo. The volume of Aleppo trade multiplied several times in the first 25 years of the Ottoman period. The markets and inns expanded, and the number of consulates, foreign communities, and European and international trade delegations increased. The French Consul in Aleppo in 1680, Darviyo, indicated that there were 75 consulates and commercial attaches in the city at that time. Aleppo had a population of 300,000 people representing diverse sectors and races. Aleppo suffered a great blow with the inauguration of the Suez Canal in 1869. The Canal moved the trade from the roads to the sea and, as a result, Aleppo lost 93% of its trade movement. Figure 2. A general view of the Aleppo Citadel (Source). Lamartine, Bardwill, Foster, Masson, Le Mans, De Rauwaiff, D'Arvieux, Volney, Dondolo, Rampels, John David, Lawrence, and Gernrodebl. The city was a good example of tolerance, free thinking and multiple races. There are many churches and 11 Christian sectors, living side by side with Muslims and enjoying freedom, tolerance and mutual understanding. All are equal under the same law. Aleppo has been described by labels as varied as "Asian Athens", "Small London", "Small Paris", "Cleanest and most beautiful city in the Ottoman Empire", "Aleppo supercedes Cairo", Aleppo, "the Citadel of the Levant", the "Aleppians are the best people in the Ottoman Empire". The history of the Citadel is intertwined with that of Aleppo. Excavations in the Citadel unearthed flint stones dating back to the seventh millennium B.C. in a temple of the old goddess of Aleppo, indicating that the Citadel was both the Acropolis of the city and its worship place. The excavations are continuing to disclose magnificent facts about the history of the Citadel and the city of Aleppo. As the Acropolis of Aleppo, the Citadel contained the temples of the gods of the Aleppine sacred trinity, Hodod, for lightning and thunderstorms, Shamsh, for the sun as symbol for justice, and Sin, for the crescent as symbol for time, as well as other gods such as Doujon, the god of fertility. The names of these gods were changed with the successive governing authorities of Amorites, Hittites, Mitannians, Greeks and Romans. During the Byzantine period, the Citadel became a place of Christian worship, and the Byzantines built two churches. Mosques were built during the Islamic period. History informs us that Seleucus Nicator, the great successor of Alexander, was the first to use the Citadel's military fortifications for defence and that he used it as his military abode. However, the Romans and the Byzantines used it as the official residence for the city's governors, and two new churches were built during the Byzantine Era. The Muslim Arabs entered the city of Aleppo peacefully on 16 AH/637 C.E. They did not, however, use the Citadel as a residential area for the governors since they built palaces for themselves outside the city, such as Al-Naoura Palace, built by Mouslemeh bin Abdul-Malek; the Hader Al-Sulimany Palace, built by Souleiman bin Abdul-Malek; and the Batyas Palace, built by the Abbasid, Saleh bin Ali. Since the Era of Seif Al-Dawla Al-Hamadani, the Citadel was used as a fortified military centre against the Byzantine aggression. After Nacfor Focas destroyed the Al-Halaba Palace outside the Antioch Gate on 351 Hijra, 962 CE, Saad Al-Doula used the Citadel as his headquarters. The Citadel was recognized as a residence of political authority during the Bani Mardas period during 414 - 472 AH/1023 – 1079 CE and thus great care was taken with the construction, fortification and decoration of the Citadel. During the period of the Zankis, Nour Al-Din renovated the Citadel and built its enclosure and a mosque, which still exists. He also constructed a prison for the captives of war of his Western enemies. A number of Crusader princes such as the King of Jerusalem, and De Caption, the Prince of Antioch, were imprisoned there. The Citadel reached its peak of glory during the period of Al-Zaher Ghazi, who ruled Aleppo for thirty years, and constructed many distinguished buildings. The Era of Al Zaher, son of Salah Al Din Al-Ayyoubi, is considered the "Golden Age" of the Aleppo Citadel. The current shape of the Citadel dates back to his time. Al-Zaher constructed 26 buildings to serve as palaces, mosques, hamamat (baths), water cisterns, towers, buildings and storehouses. He dug the Moat surrounding the Citadel and paved its walls with stones. Al-Zaher also built a palace Dar Al-Izz (House of Glory), which is considered a masterpiece of architecture. Al-Zaher Ghazi married Queen Diafa Khatoun in the Citadel, and it is believed that she played a major role in renovating the Citadel. During the time of Al-Zaher Ghazi, the Citadel became a full Royal residence with a fortified military building, as well as a self-sufficient city within the city of Aleppo. Figure 3. Inside of the Aleppo Citadel (Source). In 658 Hijra/1260 C.E., and after the collapse of Baghdad, Hulagu surrounded Aleppo city, and Aleppo was occupied according to the Reconciliation Agreement reached. However, Hulagu did not respect this agreement and, along with the Armenian King (Sis), destroyed both the city of Aleppo and the Citadel and killed the guards of the Citadel. After the defeat of the Tatars in Ain Jalout battle, they left Aleppo, but returned one year later and destroyed what have been reconstructed. However, Baibars, qalawun and Al-Ashraf Khalil, each renovated some of the buildings in the Citadel, but it has never been the same as it was during its glorious period. In 1400 C.E., Tamerlane also conquered the Citadel and destroyed it along with the city of Aleppo. As a result of this attack, some residents of Aleppo escaped the city, but most of those remaining were killed. The Mamluk governor of Aleppo city (Jokoum) made significant efforts in rebuilding the ruined part of the Citadel and renovated its Moat to maintain its Ayyubid style. He also built two towers in the North and South sides and started building the Royal Hall (Kait Al-Arsh) which was completed by the Mamluk Sultan Al-Mouaed Sheikh. The Sultan Kaitbaye rebuilt the ceiling of the Royal Hall, and the Sultan Kansoua Al-Ghouri completed the job, adding to it a marvellous nine domes. He also used the Citadel as the strategic place for his great battle with the Sultan Salim Al-Othmani. When the Mamluks were defeated in the Marj Dabek battle in 1516, Aleppo and its Citadel became part of the Ottoman Province (Welayat) and the Citadel lost its military importance. The Ottoman governors used it periodically, though they lived in other palaces most of the time. The 1822 earthquake destroyed major parts of the Citadel and Ibrahim Pasha of Egypt seriously damaged the Citadel when he took out the pavement stones of the Citadel Moat to build a military barracks inside the fortress. During the French Occupation, a defence brigade was stationed in the Citadel. In the early second decade of the last century, the French Colonel Wigan stole the Mouhrab, the magnificent wooden apse, from the Ibrahim Al-Khalil mosque in the Citadel, and transported it to France, where it remains today. This robbery is the reason that the Adiyat Society was established in 1924, by an initiative from Sheik Kamel Al-Ghazi, calling for the protection of antiquities and legacy. The history of the Citadel shows that it was the most effective military fortification in Islamic history. No conqueror was able to enter it by force and it was only through reconciliation agreements that they were able to do so. Some conquerors such as Nekfor Focas, Hulagu, and Tamerlane violated these agreements and ruined the Citadel. It was filled with water in times of siege to form a defensive barrier against attackers. Those who ruled the city and the Citadel were anxious to take care of the Moat by deepening it, fortifying its fragile points, and paving its ground with large stones. The Moat has steep ridges with many sections covered by large rectangular stones of 100 x 40 cm. Most of these stones go back to the Era of Ghazi Al-Ayyubid. Other parts of the Moat were rocky by nature. It is known that the Citadel was built on a natural hill, where buildings were constructed to form a long-lasting mixture of natural hill crowned with man-made buildings. The steep ridges and smooth tiles of the Moat hindered the attack of invaders. It is connected to the external gate by an eight-arch bridge. The bottom of the bridge goes back to the Era of Al-Zaher Ghazi and the top goes back to the Mamluk period. The side gate was built to prevent enemies from forcing their way in using a battering ram. On the door are engraved snakes as well as the names of Qalawun and Al-Ashraf Khalil. This is found in the Tower representing the Main Entrance, on which two lions are carved with a date palm tree in between. At the end of the entrance, there is a fourth door called the door of the "Laughing and Crying Lions". This goes back to the Era of Al-Zaher Ghazi Al-Ayyubid. In the area among all these doors are rooms and apertures that were used for defence by throwing boiling liquids and stones on attackers. The shrine of Al-Kheder (St George) is close to the last door. The destruction caused by earthquakes and wars are clearly visible right after passing the defensive gates. On the right hand side, a staircase can be seen leading to a well called "Al-Satour" (the Ax). The Ayyubid Royal Palace comes next, followed by the prison which was previously a water cistern. Beside the prison lie the remains of a Hittite temple of the 10 century B.C., in which lies a basalt stone representing the Aleppine trinity (Hadad, Shamsh, and Sin). Excavations are currently underway in this site. To the left of the passage, there is a Hammam (Bath) and the Ibrahim Al-Khalil mosque, from which the wooden Mihrab (Apse) was stolen and the writings related to the period of Nour Al-Din Al-Zanki. At the top left side is the great mosque, which was built by Al-Zaher Ghazi, with its square shape Ayyubid Minaret overlooking the city of Aleppo. Located to south-east of the Citadel, the barracks of Ibrahim Pasha, built in 1934, is currently used as a Museum of Antiquities in the Citadel. Next to this is a canal with 225 stairs that are linked to three outlets from the Citadel. A nearby tunnel leads to a large chamber which was used to store grain during the Islamic ages and which might also have been used as a water cistern during the Byzantine Era. Sources indicate that the Palace was built during the period of Al-Malek Al-Aziz Mohamed, the son of Al-Zaher Ghazi. Today, all that remains of the Palace are traces of rooms, a yard, beautiful arches and niches. Behind and to the east of the Palace is the Hammam, or Bath, dating back to the period of Yousuf, the second son of Al-Aziz Mohamed. The floor of the Hammam is paved with black and white stones, and it has raised seats for resting, washing chambers, and extended hot-and-cold water pipes. The Hammam has been restored and is fully functional today. This was built over the main entrance of the Citadel, and the Hall overlooks the tomb of Al-Zaher Ghazi Al-Ayyubid that lies in the Al-Madrasa Al-Soultanieh school. The Hall is almost a square (26.5 x 23.5m). Its entrance has beautiful ornaments and yellow, black and white stone carvings. Jakam Saif Al-Din, the Mamluk, started to build the Royal Hall, and Al- Mouad Sheik completed it. The Hall was restored by Katbai, and Sultan Kansoh A1-Ghori renovated the nine-domed ceiling. The Royal Hall is currently under restoration and its ceiling domes have been demolished and replaced with a straight level ceiling to maintain the style of the famous Aleppine houses. There are small windows in the Hall that were designed to shoot arrows and pour burning oil on enemies. One of the Hall corners has a door leading to a secret passage into the defence Hall in the Main Entrance. The frontage of the Hall has a large window on which the following words are inscribed: "Enter in Peace and Safety". These towers were built by Prince Seif Al-Din Jakam and renovated by Sultan Kanso Al-Ghori. It appears that they were once linked through secret tunnels to the main edifice of the Citadel and to the House of Justice that faces the Citadel. 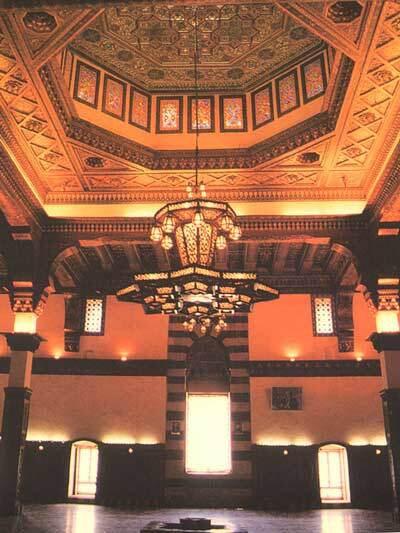 There are over forty Arabic writings in the Hall. The oldest was done in the Mardas period and bears the name Mahmoud, son of Nasr, the son of Saleh the Mardas, 465 AH/1073C.E. There are writings from the period of Nour El-Din Al-Zanki and many others from the period of Ayyubid Al-Zaher Ghazi and his son Al-Aziz Mohamed. There are also Mamluk writings bearing the names of Hakam, Barkouk, Al-Mouayed Sheik, Katbai, and Kanso Al-Ghouri. There is only one Ottoman writing from the period of Soulaiman Al-Kanoni 928 A.H./1521 C.E. "A magnificent being, and unconquerable With its high controlling watch and unscaleable sides The atmosphere sprays thin clouds on it And wears it as a necklace with shining stars It appears through lightning As a virgin between clouds"
"Opening Aleppo Citadel in the month of Safar by you is a good omen for opening Jerusalem in the month of Rajab"
"It has a Citadel famous for hindering attackers and for its outstanding height. It is similar to no other fortress. It is immune to Conquest". "Inside the Citadel of Aleppo there are two water wells, Thus no fear of parching with thirst. It is surrounded with a protecting wall and a great moat with a spring of water The wall is crowned with high towers close to each other with wall openings. Each tower is inhabited and the food remained unchanged in this Citadel for a long time. " • Al-Bîrûnî considered the Citadel as one of the three wonders of the world and Yakout A1-Hamawi has greatly admired it in his book "The Dictionary of Countries." Darvio, the Consul of France in Aleppo (1679-1686), Bokok, English, Rosso, French, Russell brothers, English, Super Nheim, Huzer Flid, Van Barshem, Sovagieh and Beiwadi Rotro. "While Time gets old, the Citadel ofAleppo Remains young Sitting up the hill puzzling the strongest conqueror One day Time was asked who you are proud of Al Shahba (one of Aleppo names) Time proudly replied". 1. Muhammad Ragib b. Mahmûd b. Hashim al-Halabi Ragib at-Tabbakh. I'lam an-nubala bi-târihi Halab ash-Shahba. (The Famous Nobles in the History of Aleppo) 2nd ed. Aleppo: al-Matbaat al-Ilmiyye, 1923. 2. Al Ghazi, The History of Aleppo Al-Ghazzi, The River of Gold in the History of Aleppo" - printed in 1342. 3. Soubhi Saouaf. 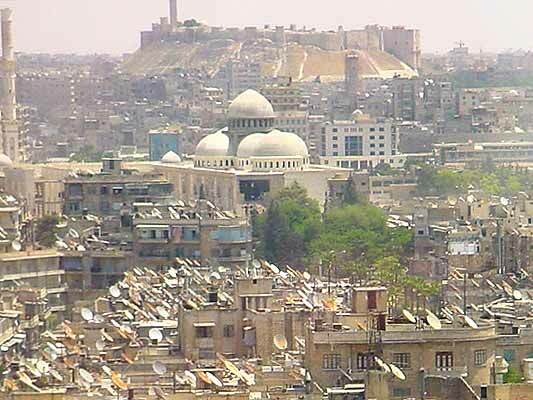 Aleppo past and present: its history, its citadel, its museum and its antique monuments. English edition [translated from the French] by George F. Miller. 1958. 4. Charles-Dominique, P., Voyageurs arabes, Ibn Fadlan, Ibn Jubayr, Ibn Battuta et un auteur anonyme, Gallimard, 1995. 5. A. Russell. The natural history of Aleppo: containing a description of the city, and the principal natural productions in its neighbourhood. 2nd ed./ revised, enlarged, and illustrated with notes by P. Russell. Farnborough, Hants: Gregg, 1969. 6. Sha'ath, Shawqi. Qal'at Halab. (The Citadel of Aleppo). Aleppo. 7. Sauvaget, Jean. Alep. Essai sur le développement d'une grande ville syrienne des origins au milieu du XIXe siècle, Paris 1941. 8. Ibn Al-Shahneh, Selected Pearls of Aleppo Kingdom. Les perles choises (Matériaux pour server à l'histoire de la ville d'alep, I. ), Transl. by Jean Sauvaget, Beirut 1933 (Memoires de l'Institut Francais de Damas).